Median income is the amount that divides the income distribution into two equal groups, half having income above that amount, and half having income below that amount. Mean income (average) is the amount obtained by dividing the total aggregate income of a group by the number of units in that group. Mode income is the most frequently occurring income in a given income distribution. Median income can be calculated by household income, by personal income, or for specific demographic groups. See also the country lists in the household income article. 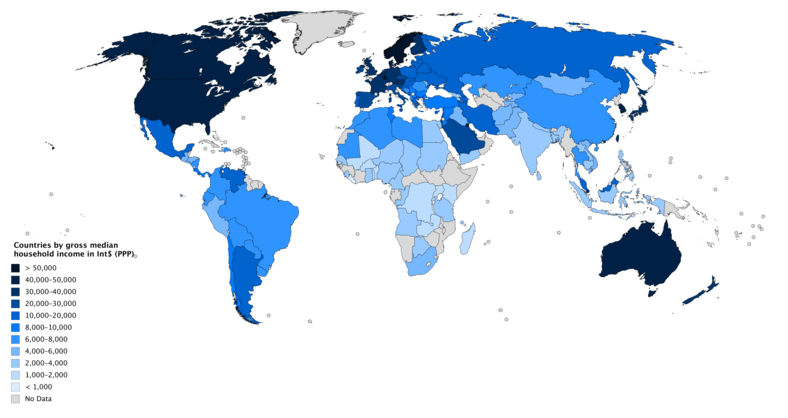 In 2013, Gallup published a list of countries with median annual household income, based on a self-reported survey of approximately 2000 adults from each country. Using median, rather than mean income, results in a much more accurate picture of the typical income of the middle class since the data will not be skewed by gains and abnormalities in the extreme ends. The figures are in international dollars using purchasing power parity and are based on responses from 2006 to 2012 inflation adjusted to 2010 levels. Below is a list of the top 30 countries. The figures do not take taxes and social contributions into account. The annual median equivalence disposable household income for selected OECD countries is shown in the table below. This is the disposable income of an equivalent adult in a household in the middle of the income distribution in a year. Data are in United States dollars at current prices and current purchasing power parity for private consumption for the reference year. Since 1980, U.S. gross domestic product (GDP) per capita has increased 67%, while median household income has only increased by 15%. Median household income is a politically sensitive indicator. Voters can be critical of their government if they perceive that their cost of living is rising faster than their income. The early-2000s recession began with the bursting of the dot-com bubble and affected most advanced economies including the European Union, Japan and the United States. An economic recession will normally cause household incomes to decrease, often by as much as 10%. The late-2000s recession began with the bursting of the U.S. housing bubble, which caused a problem in the dangerously exposed sub prime-mortgage market. This in turn triggered a global financial crisis. In constant price, 2011 American median household income was 1.13% lower than what it was in 1989. This corresponds to a 0.05% annual decrease over a 22-year period. In the meantime, GDP per capita has increased by 33.8% or 1.33% annually. A study on US Census income data claims that when using the national accounting methodology, U.S. gross median household income was $57,739 in 2010 (table 3). ^ a b c d "Worldwide, Median Household Income About $10,000". Gallup. ^ "New Measures of Global Income From the Gallup World Poll". Gallup. Gallup. December 13, 2013. Retrieved August 5, 2017. ^ DeNavas-Walt, Carmen; Proctor, Bernadette D.; Smith, Jessica C. (September 2012). "Real Median Household Income by Race and Hispanic Origin: 1967 to 2010". Income, Poverty, and Health Insurance Coverage in the United States: 2014 (PDF). U.S. Census Bureau. p. 8. ^ "Bureau of Economic Analysis". www.bea.gov. ^ Picchi, Aimee (September 13, 2016). "Median Household income increases". CBS News. Retrieved September 13, 2016.